It’s not secret that the fall season is synonymous with hearty squash and pumpkins, which I adore! They lend themselves to creamy soups, pies and hearty gratins. But there is a squash that doesn’t act like the rest–one that doesn’t belong, if you will. Are you familiar with the spaghetti squash? Upon roasting, a fork is dragged across the flesh, releasing long strands resembling spaghetti. It’s really pretty cool to do this the first time. The flavor is distinctly, though mild, squash-esque while still reaping all the nutritional benefits of its more dense counterparts: high fiber, low in calories and great amounts of folic acid to help our body convert food into energy. In this recipe I added ginger and turmeric for their inflammatory-fighting properties and for a tropical taste that kicks in (thanks to the coconut oil). 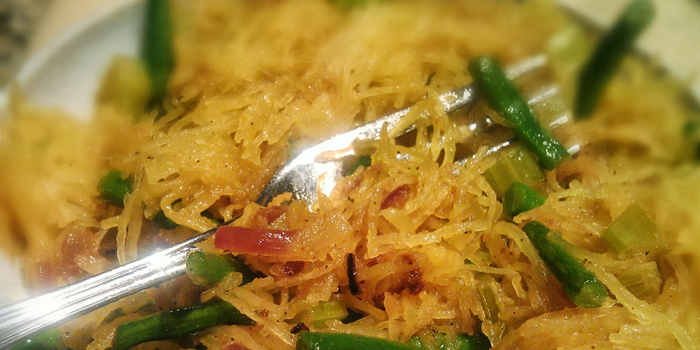 Roast the lesser-known spaghetti squash and experience the fun of making the long strands. 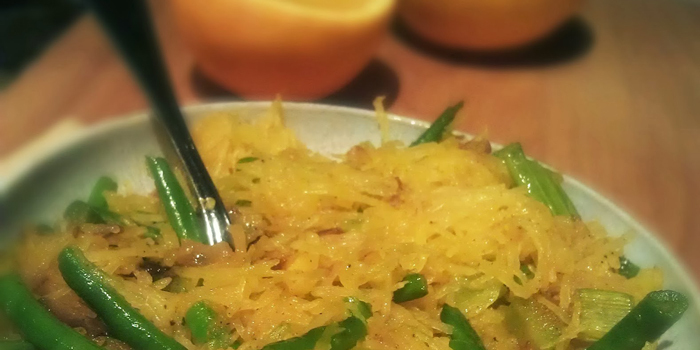 Then toss it all together in this healthy Fat and Happy Gingered Spaghetti Squash dish. Roast the squash (see Tips and Techniques area above for details). Melt half of the coconut oil over medium heat in a large fry pan or skillet. Add in the onion and celery and cook until the onion just begins to soften (about 4 minutes); toss often to avoid any burned edges. Add in the turmeric, ginger and beans and continue to cook until the beans are fork-tender. Again, toss often to mix the flavors and avoid any burning spots. Once you have the veggies to your desired doneness, add in the roasted spaghetti squash and a good dash of salt and pepper. Toss well. The pan should be just on the dry side now. Add in the remaining coconut oil and squeeze half of the orange over the pan and toss. Remove from heat. The heat of the squash will melt the coconut oil and mix with the orange to coat the spaghetti strands. Taste and adjust the seasonings as needed. You can add a bit more salt and pepper or squeeze in the remaining orange. Fat and Happy Food Blog Tips and Techniques: The difficult part about any squash is cutting through it. Make your life easier and roast it whole instead. Simply prick the spaghetti squash all over with a sharp knife (similar to how you would prick a potato before placing it in the oven). Place on a baking sheet or pan and roast in a 400 degree oven for about 1 1/2 hours until tender when pierced with a knife. Flip the squash halfway through cooking time to ensure even cooking. Cut the squash in half when cool enough to handle and scoop out the seeds. Then scrape the flesh with a fork to produce the long spaghetti-like strands.